JOHNSON U.S. MODEL 1836 PERCUSSION CONVERSION MARTIAL HOLSTER PISTOL. 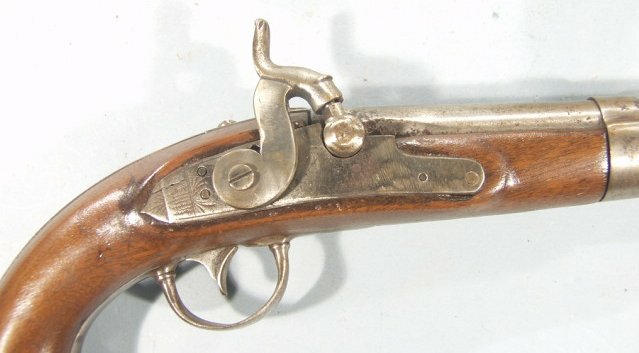 ,54 caliber with 8 1/2" barrel. 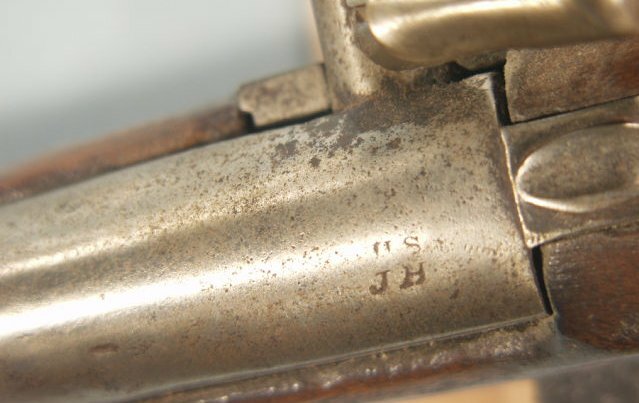 Proofed "U.S." and inspected with the initials "JH" for James Harris, U.S. Government sub-inspector responsible for inspecting all Johnson production Model 1836 pistols. Old commercial lock and hammer with drum conversion. Stock carved on left side with old period initial "JAF". Originally found many years ago in a cache of guns in the old Leesburg, VA. jail.